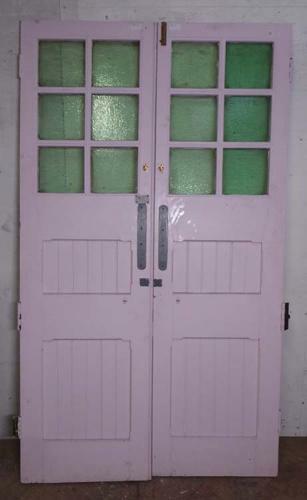 This lovely pair of Edwardian panelled pine doors are fully morticed and tenoned. Each door has six glazed panels, over one small and one larger planked solid panels, with a decorative Gothic chamfer detail to both faces. These doors are rebated. Please note: Individual doors are 24 inches (609mm) width each. These measurements are taken without the rebate. All other measurements are taken as a pair. We have several sets of these in stock - please see DP0184, DP0185, and DP0187 The doors are in excellent condition, ut are currently painted. We are happy to strip them at an additional cost. The glass is not toughened and may not comply with current safety regulations, so may need to be replaced. We are happy to quote for this, so please contact us with your requirements.